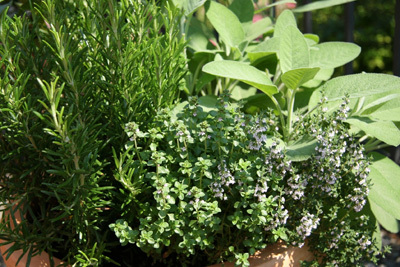 Herbs bring out the best in foods, enhancing the flavor and sensory appeal of almost every dish. If you need to be convinced, just think of plain tomatoes, bread, lamb, fish; then think of juicy red tomatoes sprinkled with fresh basil, a just baked loaf redolent of dill and parsley, a roast leg of lamb seasoned with garlic and rosemary, a grilled sea bass flavored with fennel. They can perform the same subtle magic with soups, stews, salads, breads, and even desserts. Herbs should enhance the flavors of foods - not disguise them. The entire dish should star, not a single, overpowering taste. Because the strength of the individual herbs vary, it is difficult to give a general rule for the amounts of herbs to use. It is a good idea to experience your herbs like you would a fine wine. Take a clean leaf of the herb and chew on it. Let the leaf meet the tounge and chew thoughtfully. It is not necessary to swallow the leaf, just learn about the flavor. Practice, and frequent tasting are the best teachers. To experiment with the flavors of fresh herbs, start with 1/4 tsp. fresh herbs per pound of meat or pint of soup or sauce. If you decide to increase the amount, just remember that it is easier to add than to subtract. Additionally try out recipes that call for only a single herb, so you become familiar with it. Adding fresh chopped herbs (one at a time) to something bland yet familiar, like butter or sour cream or potatoes will allow the intensity of the herb to stand on its own and helps you to know how much of the herb to add. Just start experimenting; add a little Rosemary or Thyme to the potatoes or the chicken; sprinkle some Oregano on your pizza or pasta; add some Tarragon leaves to your scrambled eggs. Keep notes, at least at first of what was pleasing, how much was used and what didn’t work. You will find this invaluable, especially when you start blending herbs together to get more complex flavors. As a rule of thumb, use 2 - 3 times more fresh herbs, when the recipe calls for dried. Soon you will find yourself knowing which herb would go with the dish you want to prepare to enhance it, and everyone experiencing the meal will appreciate it.